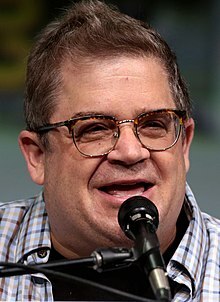 Patton Peter Oswalt (born January 27, 1969) is an American stand-up comedian, actor, voice actor and writer, known for playing Spencer Olchin in the sitcom The King of Queens (1998–2007), voicing Remy in the Pixar film Ratatouille (2007), starring opposite Charlize Theron in Young Adult (2011) and guest starring as the Koenigs on Agents of S.H.I.E.L.D. (2014–2017). He has appeared in six stand-up specials and won a Primetime Emmy Award for Outstanding Writing for a Variety Special and a Grammy for his Netflix special Patton Oswalt: Talking for Clapping (2016). Oswalt made his acting debut in the Seinfeld episode "The Couch", appeared in the superhero film Blade: Trinity (2004), starred in the comedy-drama film Big Fan (2009) and the series The Heart, She Holler (2011–2014). He currently narrates the sitcom The Goldbergs (2013–present) as the adult Adam F. Goldberg, voiced male Jesse in the video game Minecraft: Story Mode, stars in the 2017 revival of Mystery Science Theater 3000 (2017–present), voices the title character in Happy! (2017–present) and plays Principal Ralph Durbin on the NBC series A.P. Bio (2018–present). Oswalt was born January 27, 1969, in Portsmouth, Virginia, the son of Carla (née Runfola) and Larry J. Oswalt, a career United States Marine Corps officer. He was named after General George S. Patton. He has one younger brother, Matt Oswalt, a comedy writer best known for the YouTube web series Puddin'. While he was a military brat, his family lived in Ohio and Tustin, California, before settling in Sterling, Virginia. He is a 1987 graduate of Broad Run High School in Ashburn, Virginia. He subsequently graduated from The College of William & Mary, where he majored in English, and was initiated into the Alpha Theta Chapter of the Phi Kappa Tau Fraternity. Oswalt began performing stand-up comedy on July 18, 1988. After writing for MADtv and starring in his own 1996 comedy special for HBO, he went on to garner notable roles in films and television shows, his film debut coming in the 1996 military comedy film Down Periscope alongside Kelsey Grammer and his television debut in the Seinfeld episode “The Couch”. His most prominent and long-running role was as Spence Olchin on The King of Queens. His first starring film role was as the voice of Remy, the lead character in the 2007 Academy Award-winning Pixar film Ratatouille. He has also appeared in smaller roles in such films as Magnolia and 22 Jump Street. In November 2011, Oswalt played the role of Hurlan Heartshe in the surrealist comedy miniseries The Heart, She Holler on Cartoon Network's late-night programming block, Adult Swim. Also in November 2011, Oswalt appeared in A Very Harold & Kumar 3D Christmas. In December 2011, Oswalt played Matt Freehauf in Jason Reitman's black comedy Young Adult. In 2012, he played Billy Stanhope, ex-best friend of Ashton Kutcher’s Walden Schmidt on Two and a Half Men. Patton played the role of Agent Koenig on the TV series Agents of S.H.I.E.L.D. He later appeared in separate episodes as brothers Eric and Billy Koenig. He continued to appear in the second season as Billy and a third brother named Sam. In season four, he also played a fourth brother, Thurston. Oswalt had a voice over role in science fiction comedy film Sorry to Bother You, which was released in theaters on July 6, 2018. Oswalt replaces Louis C.K. in the 2019 film The Secret Life of Pets 2 as the voice of main character Max. In addition, he is set to reprise his role as Professor Dementor in the Disney Channel Original Movie Kim Possible, a live action adaptation of the 2002-2007 animated series. On April 15, 2019, Oswalt joined a host of other writers in firing their agents as part of the WGA's stand against the ATA and the unfair practice of packaging. Oswalt's stand-up comedy covers topics ranging from pop culture frivolity, such as comic book supervillains and 1980s glam metal, to deeper social issues like American excess, materialism, foreign policy and religion. He also discusses his atheism in his stand-up. On February 28, 2009, Oswalt recorded his third comedy album at the Lisner Auditorium at George Washington University in Washington, D.C. It premiered on Comedy Central as Patton Oswalt: My Weakness is Strong on August 23, 2009, and was released on DVD August 25, 2009. Oswalt's comedy special Tragedy Plus Comedy Equals Time was to be released on January 16, 2014 via online movie streaming website Epix, but was pushed back by the company for unknown reasons. However, it did premiere on Comedy Central on April 6, 2014 and became available for purchase on April 8, 2014 in both DVD and CD format. Oswalt's comedy special Talking for Clapping was released on Netflix on April 22, 2016. For the album, Oswalt received a Primetime Emmy Award for Outstanding Writing for a Variety Special and a Grammy Award for Best Comedy Album. Oswalt's comedy special Annihilation was released on Netflix on October 17, 2017. Oswalt married true crime writer and journalist Michelle McNamara on September 24, 2005. They had one daughter together, born in April 2009. Oswalt is an outspoken atheist and has referred to his atheism in his comedy specials: No Reason to Complain, Feelin' Kinda Patton, My Weakness Is Strong, and Finest Hour. Oswalt's influences include Jonathan Winters, Richard Pryor, Emo Philips, Blaine Capatch, Bill Hicks, Bobcat Goldthwait, Sam Kinison, Steve Martin, and Louis C.K. 2019 The Secret Life of Pets 2 Max (voice) Replacing Louis C.K. 2002 The Man Show Weepum Buzzkillus Uncredited; episode: "Juggy Car Wash"
2018 Robot Chicken Brock, Doug Funnie, Flamengo (voices) Episode: "Strummy Strummy Sad Sad"
2018 Big Hero 6: The Series Mr. Sparkles, Dispatch Voice (voices) Episode: "Mr. Sparkles Loses His Sparkle"
Oswalt, Patton (May 3, 2016). "Patton Oswalt Remembers His Wife, Michelle McNamara: 'She Steered Her Life With Joyous, Wicked Curiosity'". Time. Oswalt, Patton (December 2, 2016). "Patton Oswalt's Year of Magical Parenting". GQ. ^ Abernathy, Samantha (January 7, 2012). "One For The Road: Have A KFC Bowl For Patton Oswalt's Birthday" Archived January 28, 2012, at the Wayback Machine. Gothamist. ^ "Patton Oswalt: Biography, Latest News & Videos". TV Guide. Retrieved May 30, 2012. ^ "Michelle McNamara, Patton Oswalt". The New York Times. September 25, 2005. ^ Wait Wait...Don't Tell Me! (October 15, 2011). "Comedian Patton Oswalt Plays Not My Job". NPR. Retrieved April 2, 2012. ^ Oswalt, Patton (2011). Zombie Spaceship Wasteland. Scribner. p. 6. ISBN 978-1-4391-4908-9. ^ Chaney, Jen (December 15, 2011). "Patton Oswalt gets philosophical, but he's still funny". The Washington Post. Archived from the original on November 4, 2013. Retrieved December 12, 2012. ^ "Phi Kappa Tau Hall of Fame". phikappatau.org. Retrieved December 12, 2012. ^ Oswalt, Patton (February 1, 2018). "Patton Oswalt Goes Undercover on Reddit, Twitter & Wikipedia" (video). GQ Videos. CONDÉ NAST. 05:10. Retrieved February 8, 2018. 'Oswalt first began performing stand-up comedy in the late 80s or early 90s'—late 80s—'by his own reckoning'. I know the exact date, Wikipedia. I've said it in a million interviews. 'My own reckoning'—what did I, suffer a head injury? I started July 18th, 1988. I'm not some weird Norse poet. 'Ah, by my reckoning, it was a stormy night. I was out on'—No! July 18th, 1988. 'By my own reckoning', good Lord. Is [this] a Cormac McCarthy novel? ^ a b c d "Patton Oswalt biography and filmography". Tribute. Retrieved September 3, 2013. ^ a b Luippold, Ross (November 22, 2011). "Patton Oswalt Pranks 'King of Queens' By Standing Perfectly Still For Entire Scene (VIDEO)". Huffington Post. Retrieved September 3, 2013. ^ "A Look Inside: 'King of Queens' Patton Oswalt talks 'JLA: Workweek' – Comic Book Resources". Comic Book Resources. Retrieved September 3, 2013. ^ "Patton Oswalt to Host 39th Annual Annie Awards – Animation Magazine". Retrieved September 3, 2013. ^ "Patton Oswalt – AskMen". AskMen. Archived from the original on February 22, 2014. Retrieved September 3, 2013. ^ "Exclusive interview with Jim Mallon, Trace Beaulieu, and Joel Hodgson of Mystery Science Theatre 3000". Tor Books. Retrieved September 3, 2013. ^ Jones, Kenneth (December 22, 2009). "Megan Mullally and Patton Oswalt Will Have Lips Together, Teeth Apart on Broadway". Playbill. Archived from the original on December 26, 2009. Retrieved March 10, 2010. ^ "Showtime : Video : Series : Featured". Showtime. Archived from the original on April 22, 2012. Retrieved September 3, 2013. ^ "CN Premieres Robotomy on Oct. 25 – Animation Magazine". Retrieved September 3, 2013. ^ Oswalt, Patton (2011). Zombie Spaceship Wasteland: A Book by Patton Oswalt. Charles Scribner's Sons. ISBN 9781439149096. ^ Hughes, Jason (February 28, 2012). "'Two and a Half Men': Patton Oswalt Plays Walden's Bitter Old Business Partner (VIDEO)". Huffington Post. Retrieved September 3, 2013. ^ Brian Lowry TV Columnist @blowryontv (September 17, 2013). "TV Review: 'The Goldbergs'". Variety. Retrieved January 18, 2014. ^ "Bring Back MYSTERY SCIENCE THEATER 3000 by Joel Hodgson — Kickstarter". Kickstarter. ^ Rife, Katie (November 30, 2015). "Patton Oswalt is TV's Son of TV's Frank on the new Mystery Science Theater 3000". The A.V. Club. Retrieved July 22, 2016. ^ Busch, Anita (July 26, 2017). "Danny Glover, David Cross And Patton Oswalt Join 'Sorry To Bother You'". Deadline Hollywood. Retrieved May 19, 2018. ^ Blistein, Jon (May 17, 2018). "Watch Lakeith Stanfield Make Millions With 'White Voice' in Wild 'Sorry to Bother You' Trailer". Rolling Stone. Retrieved May 19, 2018. ^ The date of the DVD release was mentioned during commercial breaks the night of the special's Comedy Central premiere on August 23, 2009. ^ billybobjomes (November 24, 2009). "Patton Oswalt - Christmas Shoes" – via YouTube. ^ "A Patton Oswalt Christmas". November 24, 2009. Retrieved July 14, 2016. ^ Hartlaub, Peter (May 13, 2012). "Sf gate – DVD review: 'Finest Hour' by Patton Oswalt". San Francisco Chronicle. Retrieved November 8, 2012. ^ L. Ray, Austin. "Patton Oswalt Finest Hour special review". The Spit Take. Retrieved April 9, 2013. ^ "Patton Oswalt's TRAGEDY PLUS COMEDY EQUALS TIME Airs on Epix (and Twitter, Sort Of)". Nerdist. ^ "'Patton Oswalt: Tragedy Plus Comedy Equals Time' to Premiere Sunday, April 6 on Comedy Central". TV By The Numbers by zap2it.com. ^ Halcombe, Don. "Netflix Announces Premiere Dates for early 2016 Slate of Original Stand-up Comedy Specials". Netflix Media Center. Archived from the original on February 23, 2016. Retrieved May 26, 2016. ^ Oswalt, Patton (May 3, 2016). "Patton Oswalt Remembers His Wife, Michelle McNamara: 'She Steered Her Life With Joyous, Wicked Curiosity'". Time. Retrieved August 30, 2016. ^ Oswalt, Patton (April 23, 2009). "Alice Oswalt vs. Jason Statham". Patton Oswalt official website. Archived from the original on February 28, 2010. Retrieved April 24, 2016. So let’s make it official — on Wednesday, April 15th, my way-more-brilliant-and-resilient-than-me wife gave birth to our first child — Alice Rigney Oswalt. ^ Mizoguchi, Karen. "Patton Oswalt reveals wife Michelle McNamara's cause of death". Entertainment Weekly. ^ Zuckerman, Esther. "Read This: Patton Oswalt opens up about his grief". The A.V. Club. Retrieved August 2, 2016. ^ "Michelle McNamara's Book About 'The Golden State Killer' Will Be Released Nearly Two Years After Her Passing". laist.com. September 19, 2017. Archived from the original on November 5, 2017. Retrieved November 3, 2017. ^ Oswalt, Patton (April 25, 2018). "#GoldenStateKiller #IllBeGoneInTheDark #MichelleMcNamara One of the more surreal days of my life. We'll be watching the press conference at 3pm EST. Looks like they got him. #stepintothelight". Instagram. Retrieved April 25, 2018. ^ Oswalt, Patton (April 25, 2018). "If they've really caught the #GoldenStateKiller I hope I get to visit him. Not to gloat or gawk — to ask him the questions that @TrueCrimeDiary wanted answered in her "Letter To An Old Man" at the end of #IllBeGoneInTheDark". Twitter. Retrieved April 25, 2018. ^ "Patton Oswalt's New Fiancée Is the 'Happiest Girl in the Universe' — See Her Ring & Sweet Tribute to His Daughter!". July 6, 2017. Retrieved July 6, 2017. ^ Oswalt, Patton [@pattonoswalt] (November 5, 2017). "What'd you guys do yesterday? (Photo @jeffvespa) pic.twitter.com/WMW39tif0I" (Tweet). Retrieved November 5, 2017 – via Twitter. ^ Corinthios, Aurelie (November 5, 2017). "How Patton Oswalt Found Love with Meredith Salenger After His First Wife's Sudden Death". People. Retrieved November 5, 2017. ^ "Patton Oswalt: A Stand-Up Guy for Chained Dogs". PETA, January 8, 2013. ^ Koski, Genevieve (August 31, 2011). "Interview: Patton Oswalt". The A.V. Club. Onion Inc. Retrieved September 9, 2011. ^ "aspecialthing.com :: View topic – THE AST INTERVIEW: PATTON OSWALT". Web.archive.org. Archived from the original on October 13, 2007. Retrieved September 24, 2010. ^ "The AST Interview: Patton Oswalt". Web.archive.org. Archived from the original on October 13, 2007. Retrieved February 28, 2013. ^ a b "Patton Oswalt: The AST Interview". Archived from the original on October 13, 2007. Retrieved August 19, 2010. ^ "Chunklet". Chunklet. Archived from the original on December 14, 2007. Retrieved February 28, 2013. ^ "Chunklet". Chunklet. October 22, 2008. Archived from the original on October 26, 2006. Retrieved February 28, 2013. ^ "Chunklet". Chunklet. Archived from the original on October 26, 2006. Retrieved February 28, 2013. ^ Comedy Death Ray. "Comedy Death Ray: Music: Various Artists". Amazon.com. Retrieved February 28, 2013. ^ "Palm Springs Film Festival Names 'Young Adult' for Vanguard Award". indieWire. December 13, 2011. Retrieved September 15, 2012. ^ Feinberg, Scott (February 4, 2011). "SBIFF 2012: Virtuosos Include Hilarious Patton Oswalt, Shirtless Andy Serkis". The Hollywood Reporter. Retrieved September 15, 2012. ^ "Central Ohio Critics Award Nominations". indieWire. January 3, 2012. Retrieved September 15, 2012. ^ Natalie Abrams (July 25, 2014). "Agents of S.H.I.E.L.D. Reveals New Characters, Carter Adds Captain Directors". TVGuide.com. ^ Nordyke, Kimberley (March 8, 2019). "'My Little Pony' Sets Ninth and Final Season on Discovery Family". The Hollywood Reporter. Retrieved March 8, 2019. ^ Oswalt, Patton (November 8, 2011). "Zombie Spaceship Wasteland: A Book by Patton Oswalt". Simon and Schuster – via Google Books. ^ "Zombie Spaceship Wasteland: A book by Patton Oswalt - Leisure". Scribd. Wikimedia Commons has media related to Patton Oswalt. Audio interview on The Sound of Young America from PRI.